What Are Dental Crowns Made Of, Anyway? 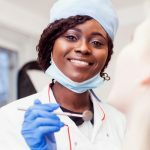 Learn about the best type of dental crown for every situation. When a tooth lacks stability, a dental crown can restore its appearance, size, and strength. 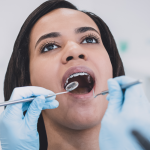 Dental crowns are needed to protect the tooth after procedures such as a root canal, dental bridge, and dental implant. Patients may also get a crown to cover a disfigured/discolored tooth, or to support a tooth that has become weakened from tooth decay. If you think you might need a crown, you’re not alone. Single crown placement is the most common restorative procedure performed in the U.S.! Once you have determined your need, you may ask what are dental crowns made of? The appropriate material for your crown will vary depending on where the crown is placed in the mouth. What are Dental Crowns Made of for Highly Visible Teeth? All porcelain/ceramic crown. These two options allow the dentist to choose a shade that closely resembles your teeth. All-porcelain and all-ceramic crowns more closely resemble your natural teeth, making them a popular choice especially for front teeth. On the other hand, this material makes them less strong than certain other types of crowns, such as ones that include harder metals. Porcelain-fused-to-metal. Aside from the above, porcelain-fused-to-metal is the most natural-looking option. These crowns have a metal structure with porcelain covering it, which make them more durable than an all-porcelain crown. This material makes it a strong yet natural looking choice. The potential disadvantage is that the underlying metal can begin to show as a dark line next to the gums, especially in the case of gum recession. What are Dental Crowns Made of for Molars? Gold metal crown. These crowns are made of a gold alloy (a mixture with other metals). Gold has the best longevity of any crown type and will rarely break. Since they are gold in color, they’re usually used for teeth positioned at the back of the mouth, where they won’t be as visible. Gold crowns are preferable for molars, which need to be strong to bite and chew hard foods. 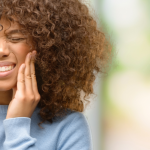 They’re also the best type of dental crown for people with TMJ or bruxism, as these conditions put more pressure on the teeth. Over time, pressure on the teeth can cause the gum to recede and expose parts of the tooth root to plaque. What are Temporary Dental Crowns Made of? Stainless steel crown. This is a prefabricated crown that is used on teeth as a temporary measure. The crown protects the teeth while a permanent crown is being made from another material. 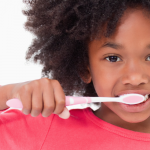 Stainless steel is the most common material used for pediatric dental crowns, which protect baby teeth from decay until the adult teeth come in. Once the tooth comes out, the stainless steel crown will fall out naturally. The other advantage is that it doesn’t require multiple dental visits to put in place. Crown Material. Pricing will vary based on on what the dental crown is made of. All-porcelain crowns are more expensive than gold crowns, which in turn, are pricier than porcelain-fused-to-metal crowns. Insurance. Some people do not have insurance but can sign up for dental plans, which offer reduced rates for members within a local network. If you have insurance, it may cover part of the cost of a crown. There are also assistance programs provided by the state which can ease costs. The Specific Dental Clinic. Rates may vary from one dental clinic to another, sometimes depending on location. 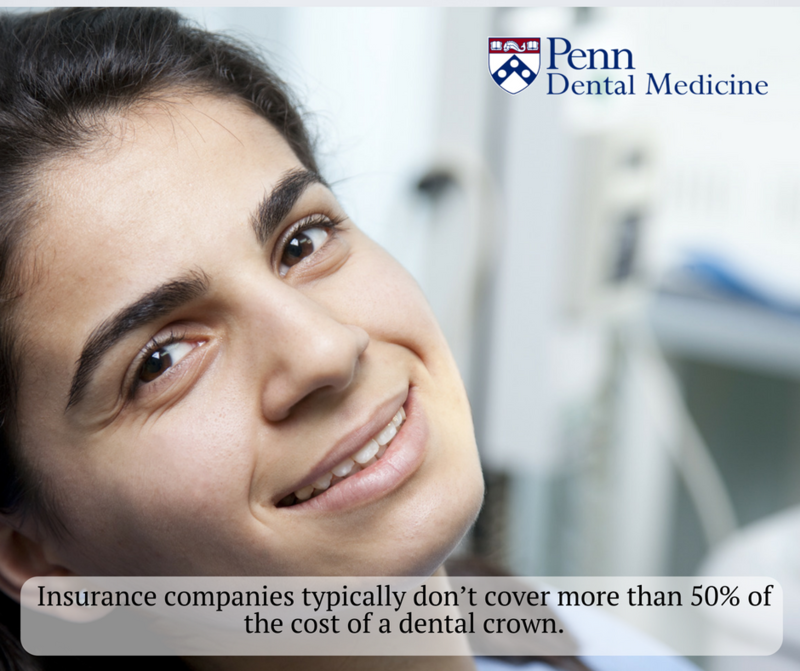 Penn Dental Medicine operates out of a dental school, which allows us to offer reduced prices for crown procedures as compared to other local clinics. Ready for your affordable dental crown? To learn more about the rates offered at Penn Dental Medicine or to schedule a crown consultation, please call us at 215-898-8965!